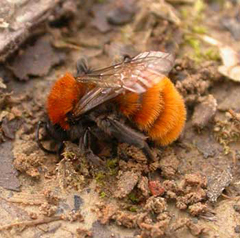 Aculeates are part of the vast insect order, the Hymenoptera. The defining feature of all aculeates is that the egg-laying ovipositor is modified to form a sting. The majority of species hide their larva and their food provisions in safe retreats. In Britain there are around 590 species of aculeates. These include ants, bees and wasps. Aculeate life histories are many and varied. Above: A tiny parasitoid wasp, Gonatopus clavipes. A solitary wasp, Cerceris rybyensis with prey (a Lasioglossum bee) which it has stung and paralysed. BEES - most bees collect pollen which their larvae feed upon. Bees - solitary nesters in the ground - the mining bees. Bees - solitary nesters in aerial locations such as borings in timber or hollow dead stems of plants. Bees - social nesters, such as honey bees and bumblebees. Bees - cuckoo species on solitary and social species. These do not collect pollen. They are cuckoos in the nests of solitary or social bees. For a comprehensive overview of bees, you can download the text of Bees in Britain. WASPS - most wasps capture, sting and paralyse prey that are fed to their larvae. Most species usually have a narrow range of prey that they will hunt, such as weevils, flies, caterpillars, aphids or spiders. Wasps - social nesters including hornets and the well known yellow and black social wasps. Wasps - spider hunting wasps, that specialise in taking spiders as prey. Wasps - parasitoids. Aculeate parasitoids are very small, parasitising beetles, lepidopterous larvae and homopteran bugs. ANTS - all ants are social insects, living in colonies that comprise one or a few queens and up to many thousands of worker ants. There are no solitary species, although there are just a few parasitic species that have no worker caste and rely on the workers of the host nest that they inhabit. Ants - slave-making ants have their own workers and they raid other species to supplement their workforce. A female Andrena fulva (tawny mining bee), a common spring bee, starting to excavate a nest in loose soil. 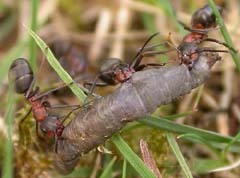 Three worker wood-ants, Formica rufa, cooperating to carry a cranefly (Diptera: Tipulidae) larva back to their colony. 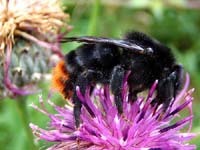 A cuckoo bumblebee Bombus rupestris. This bee invades the nests of Bombus lapidarius, usurping the social bee queen. The host worker bees bring up the cuckoo's offspring. The BWARS Members' Handbook contains more details of the life histories of aculeates. The handbook is free to all new members. Jeremy Early's superb website contains many excellent photographs of aculeates together with numerous fascinating descriptions of aculeate activity. Look for links across the bottom of the pages. 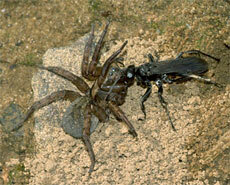 A spider wasp, Anoplius nigerrimus, dragging a paralysed spider back to its burrow.